Well, fortunately, knockout has a solution for us. Let’s take the exact same problem and we will try to solve it with Knockout this time. 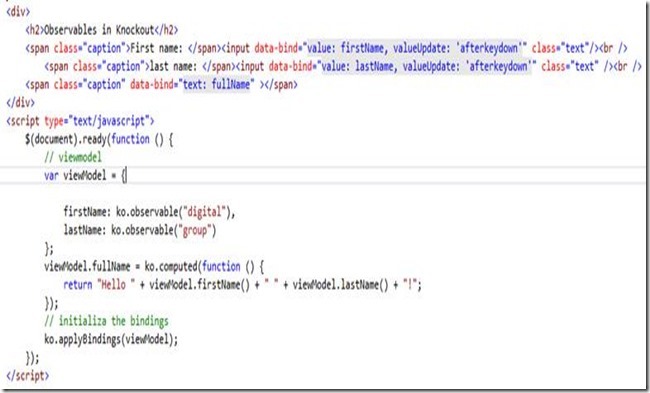 In the sample code shown above, we have declared our UI bindings using data-bind attribute, note that property names are directly bind’d here, and then in scripts we have our view-model with some default data. Now the most important thing is the saveToJson method in which we are using a knockout helper method ko.toJSON which returns json data for any object. 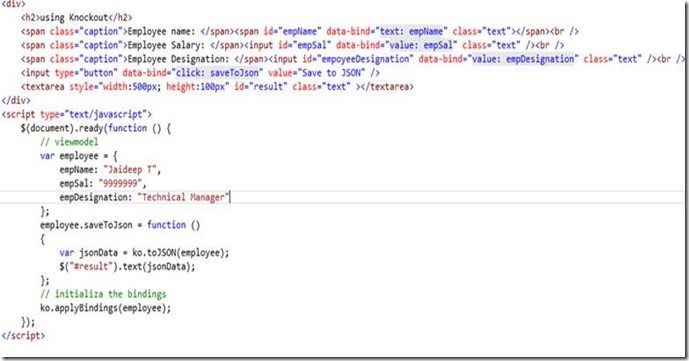 Now you can take this json data and pass it to server to perform save operation. Cool…isn’t it? You can keep extending your UI for more information (like address, phone number and personal information) and just update your binding, that’s all! Knockout will keep track of your UI and data for you. As you see it takes care of all the heavy lifting’s for you and provides you a simple interface to hook up your view model. The end result is also very convincing, a clean and better way of doing things. Observable is another powerful feature of Knockout. Observables are declared using ko.observable() function call and then knockout keeps track of its value. You can extend observables to update other objects, properties, raise events and even perform validation on entered value. Let’s take a very simple example of asking user first name and last name and printing the full name. Check out the above code snippet, we are not doing much and yet we have everything working. Unlike jquery, neither we are capturing any events nor we are worrying about data manipulation, knockout is doing everything for us. As you see in the example, our view model has a collection of companies and each company object has a collection of employees. There is nothing fancy in the array but our UI markup has something new which we didn’t see earlier. 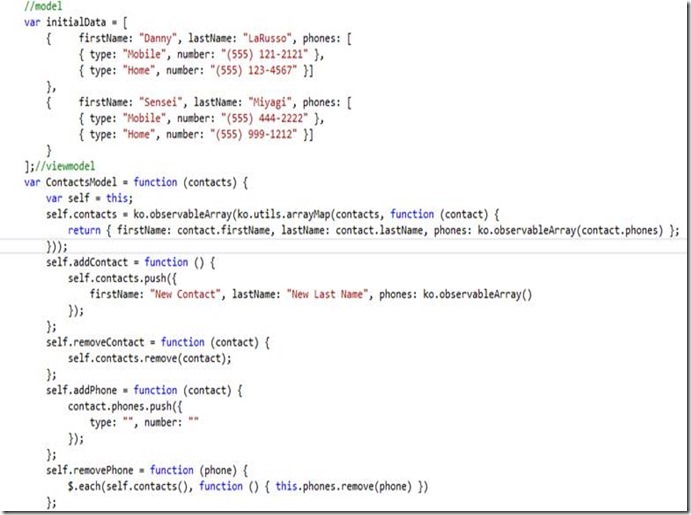 Knockout has in-built support for collections using “foreach” data bind attribute to loop through all the elements of an array. Once you define any such binding, knockout knows that it has to repeat the UI markup for each of the elements in that array. Not only does it handle the looping iterations elegantly but it also manages the context very well. So for instance, the outer loop (foreach) has company object specific bindings and inside, we have employee object specific binding. Knockout knows exactly how to change the context and which events to plug in at runtime so that correct events are trigged at runtime. Automatic UI refresh is one of the coolest feature of Knockout. As the name suggests, it refreshes the UI automatically when the underlying data changes. The example discussed in above feature also shows the Automatic UI refresh feature, but I’m going to take a different scenario from real world to show you that it’s indeed a coolest feature ever. 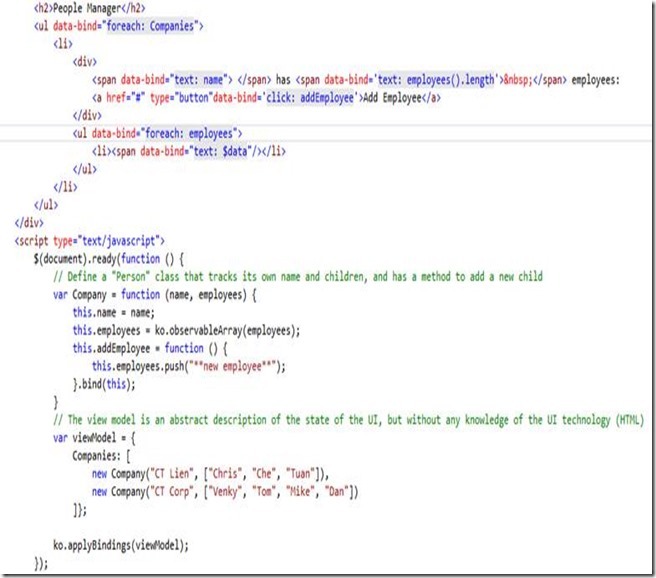 The very first thing to notice from the sample above is the separation of concerns, my initial data (Model) is separate from View model and UI markup, in real world, you would want to keep your model providers, View Model and HTML markup in a separate files, so that you achieve good control over separations. After you run the (05-Automatic UI Refresh.html) file from sample project you would notice that, after you click on add or delete buttons the UI refreshes automatically when in reality we are only manipulating the data. Any changes to data are being tracked down on UI and vice versa. 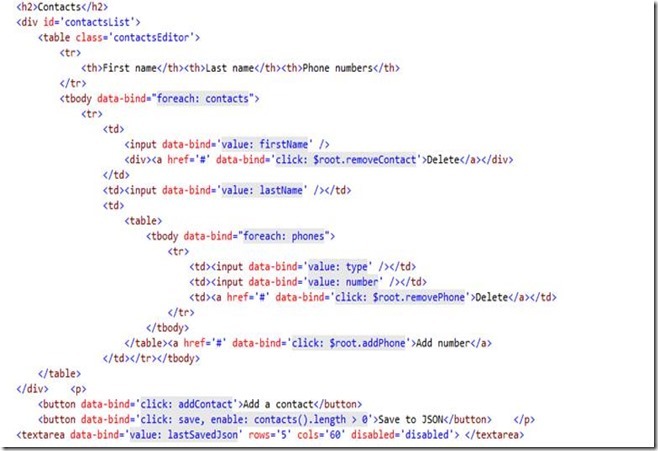 This is happening because through bindings knockout knows which html element a data property is mapped to and what to do when any of the data or UI changes. 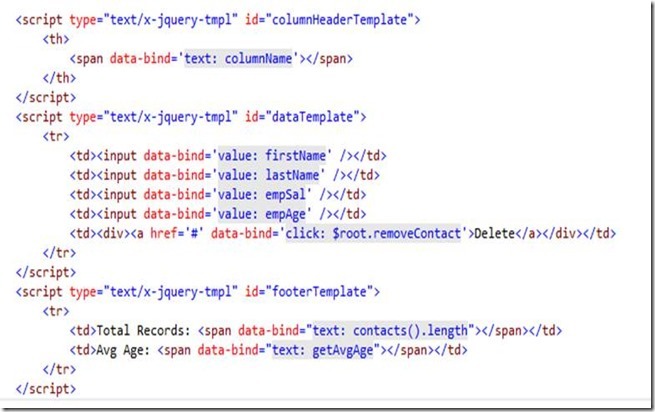 Templates are defined in script block with a script-type little different than usual. This is tell browsers not to execute this immediately, we would like knockout to compose this template when needed at runtime. Finally, our view model, which is a regular knockout view model with some sample data. 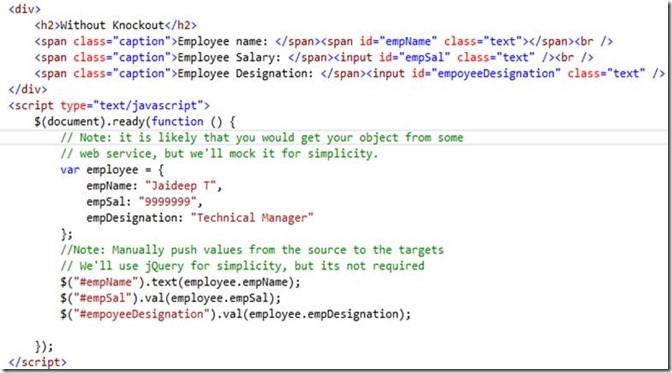 Note that actual logic of rendering UI lies with knockout template engine. It will take the instructions from UI markup and render the UI and plug in necessary DOM events. Template support is a simple and yet very powerful feature of knockout which could be extended to build high performing enterprise apps. Lastly, knockout lets you think in terms of your data rather than controls and events. 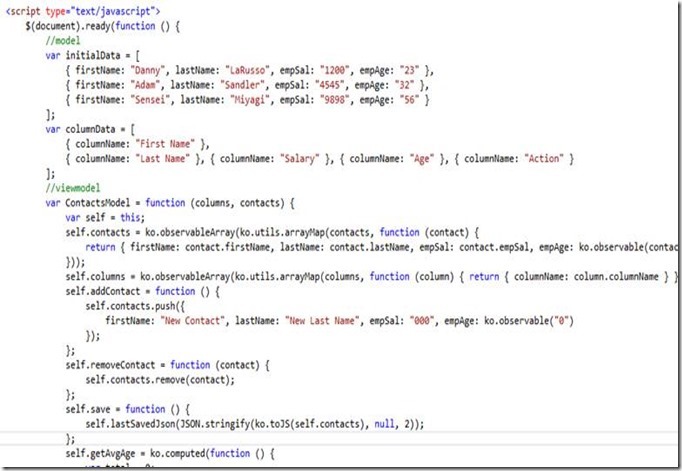 Next time you have a web page to display some data, think in terms of your domain object, use knockout to display and manipulate the data, after the user has done editing, send the object back to server in JSON format. 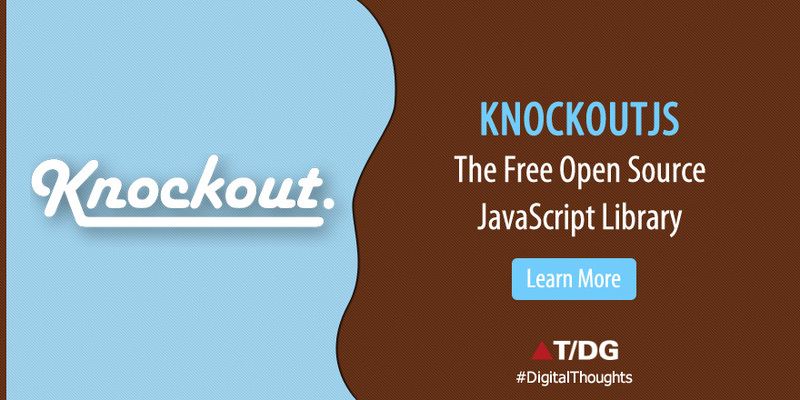 Knockout is simple and yet very powerful library and comes handy in web application development. Try it out in your next project to take advantage in terms of developer productiveness, better control over your data and doing more with less code. Hello! I wish to say that this article is amazing, great written and include approximately all vital infos. I would like to look extra posts like this . Thanks Chetan Vihite's it is very useful post. Very nicely and briefly elaborated. I person like me with non-technical background could understand except the codes :) Good job.